This abacus was used in a Victorian classroom. At school, children would learn the 'four rules' of mathematics - addition, subtraction, division and multiplication. An abacus (sometimes considered the world's first computer) helped with all these. 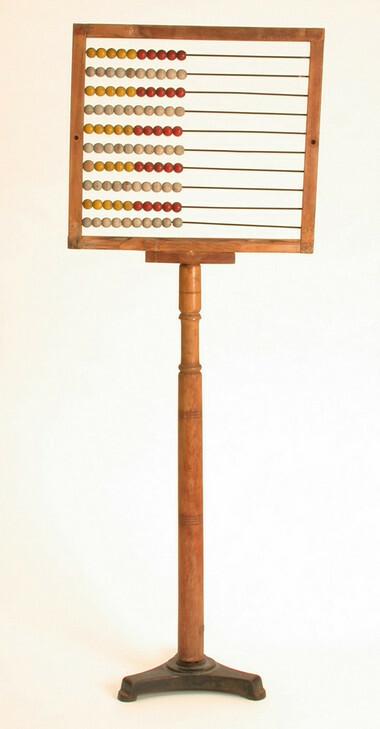 The frame of this abacus is made from wood, as are its coloured beads. It stands on a metal base that makes it very solid and it is tall, so that the whole class can see it. As well as using the abacus for calculation, Victorian pupils would also write sums down. Older children used pens and paper, and younger children used either slates or sand trays. Children would learn their times-tables by chanting them aloud, either as a class or, more scarily, on their own in front of the class. The abacus was first developed by the Chinese during the Chou dynasty (about 1122-256 BC). By 500 BC, it was widely used in China, and is still used in China, Japan and other countries. A skilled abacus operator can move the beads faster than most people can key in to a calculator.